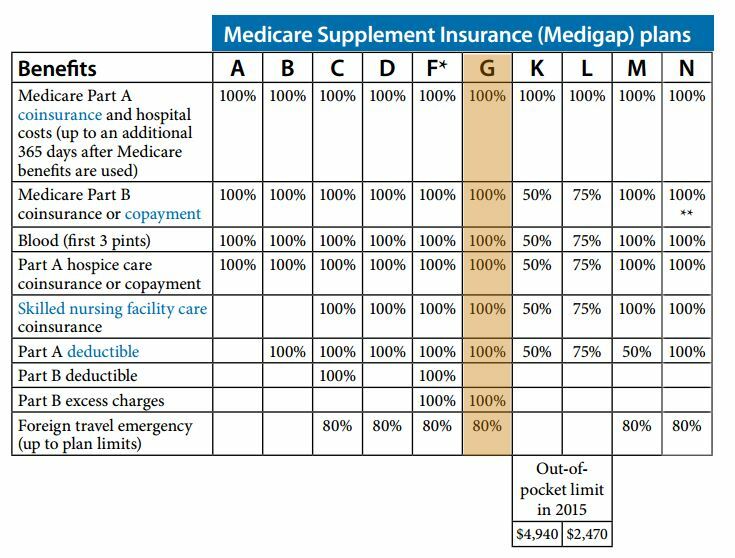 Medicare Supplement policies (also known as Medigap policies) are standardized and must follow federal and state laws designed to protect you. Insurance companies can only sell you a "standardized" policy identified in most states by letters (see the chart below). All policies offer the same basic benefits but some offer additional benefits, so you can choose which one meets your needs. As you can see in the comparison chart there are many options from which to choose. As licensed insurance agents we can help you understand the differences between the plans so that you can decide on the right plan for you. In Massachusetts, Minnesota, and Wisconsin, Medigap policies are standardized in a different way. Keep in mind, that the Medicare Supplement policies covers co-insurance after you've paid the deductible (unless the Medigap policy also pays the deductible). The chart below shows basic information about the different benefits Medigap policies cover. * Plan F also offers a high-deductible plan. If you choose this option, this means you must pay for Medicare-covered costs up to the deductible amount of $2,240 in 2018 before your Medigap plan pays anything. ** After you meet your out-of-pocket yearly limit and your yearly Part B deductible, the Medigap plan pays 100% of covered services for the rest of the calendar year. *** Plan N pays 100% of the Part B coinsurance, except for a co-payment of up to $20 for some office visits and up to a $50 co-payment for emergency room visits that don't result in inpatient admission.